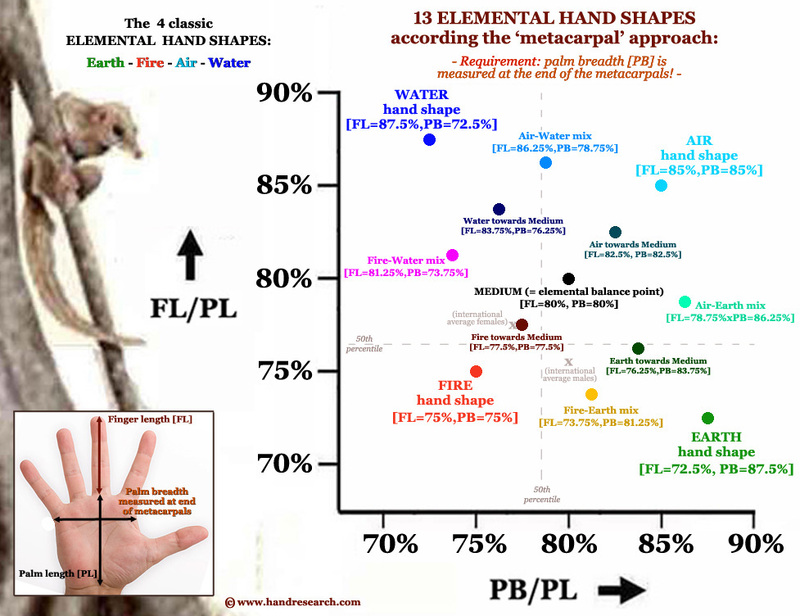 The picture above serves to describes how to find your Elemental Hand Shape in just 3 steps. 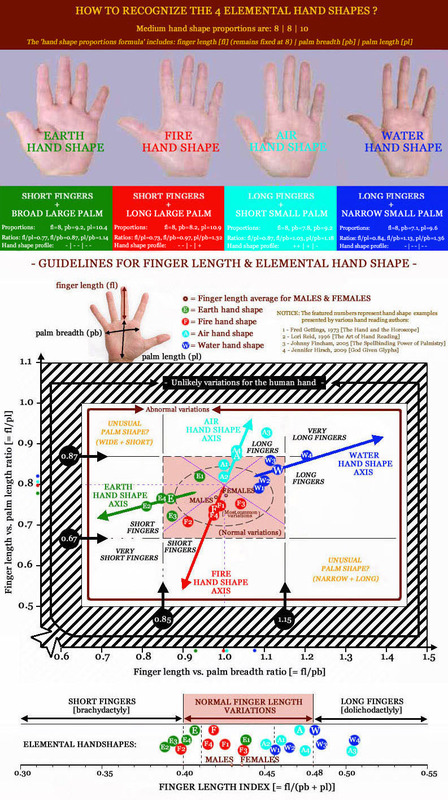 Find your hand shape dimensions by measuring your finger length (fl), palm breadth (pb) and palm length (pl) as indicated by the hand at the top of the picture. Then you can find the RATIO-SIGN (in terms of '+' and '-' signs) for each ratio in the center-part of the picture. The three RATIO-SIGNS together represent your 'hand shape profile': in the bottom part of the picture above you can find out in which category of the elemental hand shape types your hands are. NOTICE: Your 'hand shape profile' may vary between your right- and left hand. And more details about how to find out if you have a 'pure' hand shape or one of the 'mixed' hand shapes is described in my article: Finger Length Proportions and Hand Shapes! was written by Jennifer Hirsch. Although my name is mentioned at the end of the article, it was only because the magazine was published locally near me in UK, and Jen is in S.Africa., so I acted as liaison. 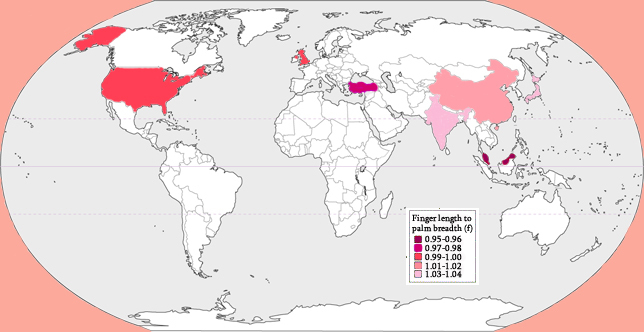 I have created a world map for 'finger length' & 'palm breadth' - based on data presented by international biometric hand studies. The patterns are quite obvious: Europeans and Americans tend to have (slightly) shorter fingers and/or wider palms than Asians. Unfortunately such info is only available for a few countries; if anybody finds likewise info for other countries... you are very welcome to share! 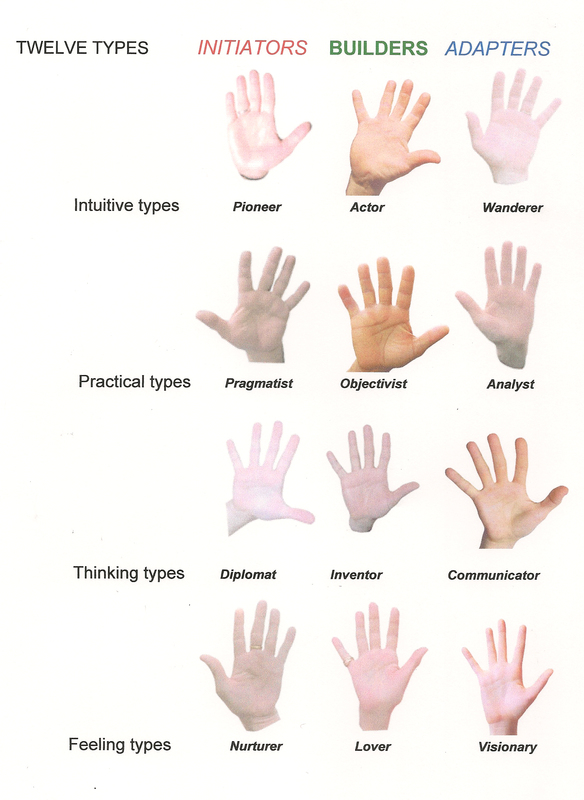 Here's an interesting innovative picture presented by US palmist Mark Seltman, describing 3 sub-variants for each of the 4 hand types (intuitive = fire hand shapes; practical = earth hand shapes; thinking = air hand shapes; feeling = water hand shape). I can now report that I have made more progress in my research on how to assess 'elemental hand shape' properly, the picture below shows that the 4 elemental hand shapes closely resemble principles that can be derived from the assessment of 'palm length' & 'finger length'! I think these principles are much more specified than the traditional use of the term 'square palm', especially since a true 'square palm' is very rare! Sorry Martijn, I still prefer the version I use! In elemental hand reading there is no such thing as an ether palm shape. Lynn wrote: Sorry Martijn, I still prefer the version I use! (NOTICE: All three pictures inside the article also present statistical clues - in terms of $percentiles - regarding how to discriminate 'ordinary' hand shapes from 'extraordinary' hand shapes). Just like the 5th element 'ether' represents a principle that is indescribable... one could argue that an average hand shape provides 'freedom of choice'. I think using such a principle also solves the problem regarding hand shapes that represent a perfect 'mix' of all 4 hand shapes. By the way, this is not just about me having a wish to re-defining the elemental hand shapes. The thing here is that I found underlying principles that result from what I could describe as the ''international average hand shape" (based on data reported from 8 countries) - which indicates that there are principles which more precisely describe the differences between the 4 hand shapes. This goes beyond the 'experiment' that I started a few years ago focussed on visual examples of the 4 elemental hand shapes inside books of well respected authors (Fincham, Reid, Gettings & Hirsch) - though I needed that earlier 'experiment' in order to become aware of the (simple) principles that I described for the individual hand shapes. By applying the three qualifications 'short', 'ordinary' and 'long' to both dimensions (palm length & finger length) it becomes also much more easy to describe 'mixed' hand shapes precisely! While using the 'flip-flop' principles 'square palm' and 'rectangle palm'... one could argue that there is no fundamental principle which describes how a 'square palm' can be discriminated from a 'rectangle palm'... especially as there is no fundamental issue that can be used to describe the difference - because there is simply nothing in between a 'square' and a 'rectangle'. I hope these answers are helpful? 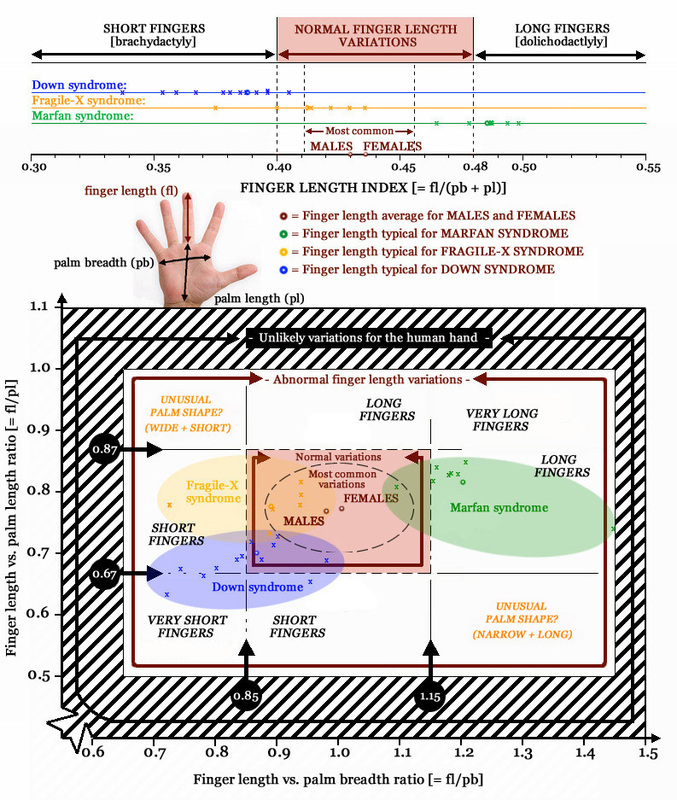 For me it is fascinating to have become aware how the 'fire hand shape' can fundamentally be understood to be composed with 'unbalanced proportions' (finger length = short, palm length = long => this concerns a stress-full combination since inside the primate family palm length always shows a tendency to be significantly longer than finger length!!!)... which appears to reflect a parallel to the most stricking aspect of the element 'fire': it's 'unstable' nature! re "there is simply nothing in between a 'square' and a 'rectangle'." Yes you are right, we should use the word oblong instead of rectangle. In the element system the element ascribed to the handshape isn't just a label, it is the manner in which they express their energy according to the principles of that element. How would you say these ordinary, average "ether" handshapes go about using their energy? Lynn wrote: re "there is simply nothing in between a 'square' and a 'rectangle'." Yes you are right, we should use the word oblong instead of rectangle. Hmmm... formally, I think far most palms would qualify for the description 'oblong', probably also most of the ones that you would associate to represent a 'square' palm shape (because in far most hands palm breadth is clearly longer than palm length, which resembles an 'oblong' shape). 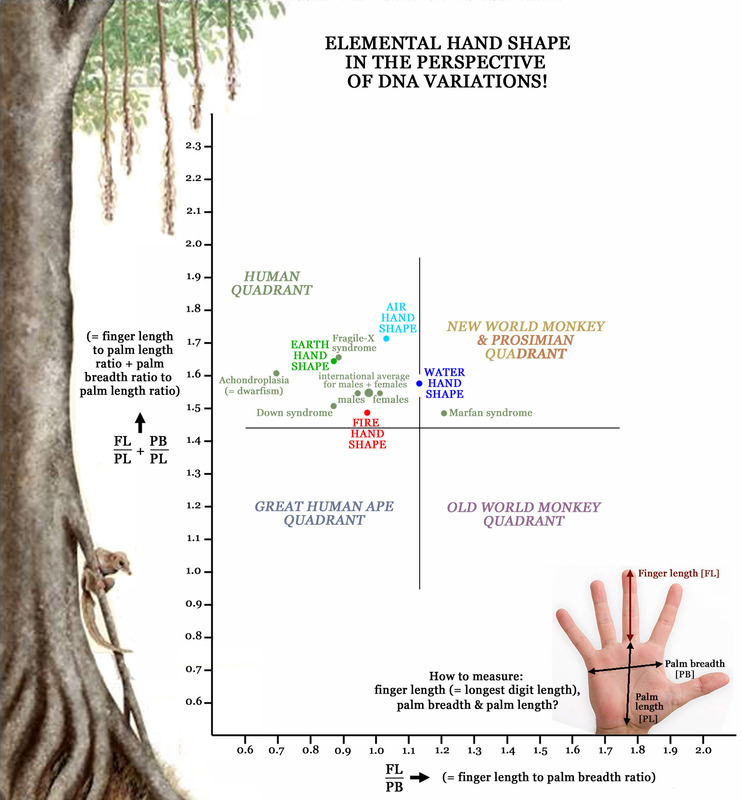 One could say that the average 'ether hand shape' is less specialized... but instead it has a nature that has the quality to be able to choose it's energy - like a cameleon that has the quality to 'adapt' it's skin color to it's environment. So, I think we could argue here that the main quality of the 'ether hand shape' is the quality of being able to use of four energies (earth, water, fire & air) whenever appropriate... but in a manner that is less specialized than seen in the other four hand shapes (which are more able to act with specialized energy according their element). I've been playing poker, and besides by means of the body tells, the expectation for the cards of the opponent can be narrowed down by knowing the statistics. Some players have tediously learned them by heart, other players just get a feel for the probabilities by playing a lot. In the latter case it is said that he plays by intuition, and that is what almost all expert players do. I think the best way is to see a lot of (measured) examples. Find your elemental hand shape in 4 easy steps!